Jon Fosse, the Norwegian novelist and playwright is one such example. Although he’s been around for years (and long-rumored to be on the shortlist for the Nobel Prize) I had never read nor even heard of him. His most recent novel, BOATHOUSE, was my introduction to his spellbinding work and since reading it I’ve gone backward, reading earlier translated books of his, each one more unique and singular, an argument for Fosse’s profound standing in the world. The first thing a reader will notice when reading BOATHOUSE is the repetition. The same words, indeed, the same sentence, occurs repeatedly through the first page and throughout the novel. The reader is immediately submerged into the mind of a man whose thoughts are both anxious and repetitious; this isn’t some fancy trick, Fosse wants the reader to feel they are hearing, even experiencing the thoughts of this man as quickly as they surface. The man in his thirties and lives with his mother in a small village. Over the summer an old high school friend returns with his wife and children. The wife and the narrator become acquaintances and suddenly a sense of betrayal is palpable. BOATHOUSE reads like a thriller but it’s not. Bad things are perpetually on the horizon, seduction, secrets and being unfaithful swell as the book progresses. It is written in a stream-of-conscious style that may not be for everyone, but I can attest I fell in love with this haunting book and wanted to read everything by Fosse. BOATHOUSE lingers in the mind of the reader while they are reading it and long afterward. 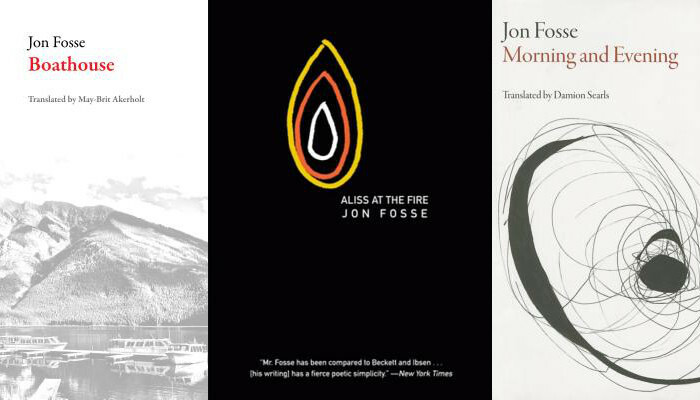 Two earlier books by Fosse that I suggest are MORNING AND EVENING and ALISS AT THE FIRE, both testaments to a unique voice in the world of European literature.